The MIT Sloan CIO Symposium brings together the academic thought leadership of MIT with the in-the-trenches experience of leading, global CIOs. Volunteering for the Symposium is a great opportunity to expand your personal network and learn how cutting-edge technology is changing management practices. Are you a marketing whiz or project leader? Do you have a passion for social media or web design? Do you enjoy client/customer sales and service? Stick your toe in the water and learn more about the Symposium and whether it’s a fit for you by attending our volunteer kickoff meeting. 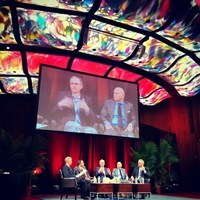 To learn more about the Symposium, visit www.MITCIO.com or email the Chair, Lindsey Anderson. For more information, contact landerson@mitcio.com.